An assessment of U.S. spending for water aid shows that funding from USAID has increased while Millennium Challenge Corporation grants for water have dropped. The United States government spent $774 million on foreign aid for the water and sanitation sector in fiscal year 2009, down from the $1 billion spent the previous year, according to a State Department report released today. The overall decrease comes from a decline in Millennium Challenge Corporation funding from $547 million to $121 million between 2008 and 2009. MCC grant packages are designed with input from the recipient country and disbursed over a period of five years. A press officer for the MCC told Circle of Blue that the funding decrease could be attributed to recipient countries requesting less money for water projects. Meanwhile funding for USAID in the last fiscal year increased by 22 percent, to $598 million. The increase is partly a result of the Paul Simon Water for the Poor Act, which was signed into law in 2005 to put greater emphasis on water supply, sanitation and hygiene (WSSH) in U.S. foreign assistance. 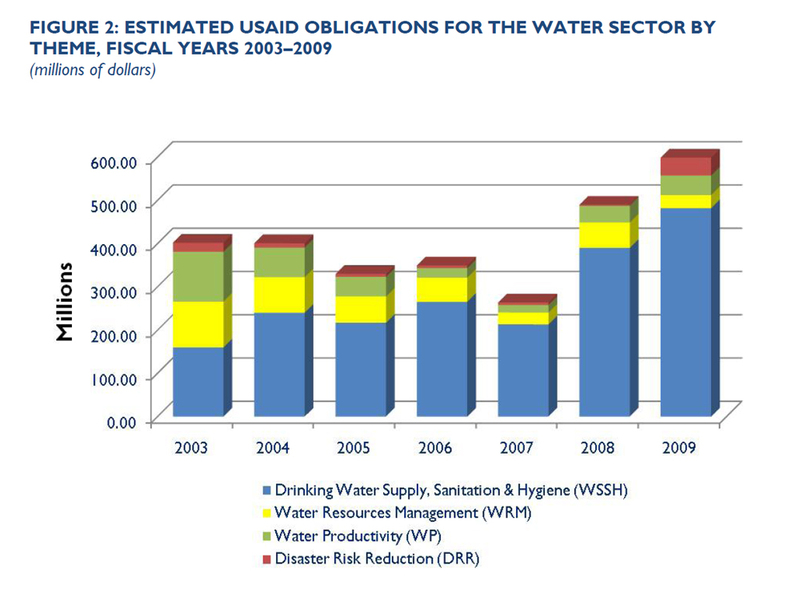 As the lead agency for this sector, USAID has tripled its spending on WSSH since 2003. In the 2009 fiscal year, USAID’s investments provided improved access to water for 5.7 million people and access to sanitation for 1.3 million, the report states. However, people in the water development field caution that these types of short-term metrics should not be the focus. The State Department report does not re-evaluate past projects. Geographically-speaking most of USAID’s water aid is spent in the Middle East (32 percent), sub-Saharan Africa (31 percent) and Asia (27 percent). Since 2005, the U.S. government has invested $3.9 billion in foreign assistance for the water sector, excluding Iraq. Projects in Iraq alone total $1.9 billion over the past four years, according to the 2009 report. Grants in the last year focused on small-scale, low-tech water solutions such as public taps, water purification, tube wells, hygienic latrines and septic tanks. The U.S. also contributes funds to development banks and international organizations that spend money in the water sector. The development banks such as the World Bank, Asian Development Bank and the Inter-American Development Bank spent $9.2 billion on water-related projects last year, the report states. That amount is more than double what was spent the previous year. This annual report to Congress is required by the Water for the Poor Act. The release of the 2010 assessment was delayed for several weeks due to the inclusion of more detailed country reports than in past versions.